I wanted to make a cake for the boyfriend’s birthday, but cake is difficult to “grab and go” at his place of employment, so I made cupcakes. I went with the Hershey’s Chocolate Cake recipe, smothered these babies with Ina Garten’s Peanut Butter Frosting and topped them with a miniature a Reese’s Peanut Butter Cup, Autumn themed sprinkles and/or chopped Reese Cups. I use the Hershey’s recipe a lot because it is tried and true in my kitchen; however, I want to experiment with other recipes in the near future. This frosting recipe was a first for me, I doubled it, so I would have enough to slather on 24 cupcakes. 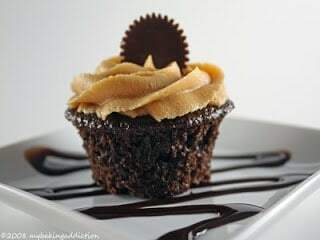 The frosting recipe was very straight forward and required simple ingredients, I chose to use Reese’s Creamy Peanut Butter because Reese’s were the theme of these (in case you have not caught on to that) plus it was cheaper than Jif. I loved the way these looked after they were decorated, they were so autumnal…and very tasty too! The boyfriend’s co-workers are very pro chocolate and they seem to shun anything fruit based (fruit desserts go to my school, where they will eat anything) , so I have to keep this in mind before I decide what to send in with him. These were deemed “amazing” and went over very well. Enjoy! *Remember to stay tuned to my blog because next Tuesday I will have a little fall inspired giveaway! Great looking birthday cupcakes! I love Ina’s peanut butter frosting…so easy and so great! 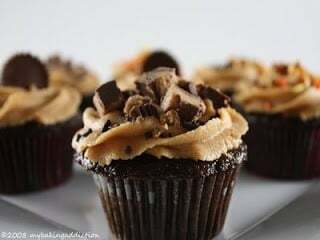 mmmmm..who can go wrong w/ chocolate and peanut butter?? ?Ohhhh soooo yummy!! Oh boy, do these look good. I’m a chocolate with PB fiend!! Just found your blog and wanted to tell you your photographs are beautiful and these cupcakes look amazing. Who doesn’t love pb and chocolate? Can’t go wrong with the combo! What a fabulous birthday treat. I so wish I could have one for my Friday sugar fix. You are so talented! These look so good! I’ve made both the cupcakes and the frosting before (although not together). I know it would be a fabulous combination! My perfect cupcake flavors…looks fabulous! great combination of [eanut butter and chocolat minicake which brings out the awesome taste, a real yummy one! My gosh you always post the yummiest foods! Seriously, they look amazing! I made choc. & pb cake, but these cupcakes look great! oooh, peanut butter frosting is such a good idea! It looks delicious! These cupcakes look incredible. Gotta love PB and chocolate. Mmmm, that frosting looks divine! 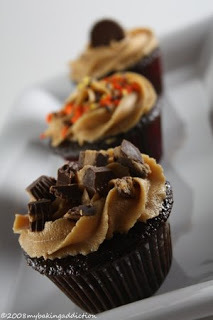 I was going to make peanut butter cupcakes and I thougt where can I find the best recipe….? Oh my, these were fabulous. I highly, highly recommend making these!!! !